Put Fish on Your Plate! 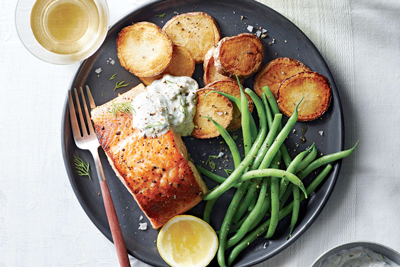 Fish are a great choice for serving up lean protein with plenty of vitamins and minerals. Fish also are a natural source of omega-3 fatty acids – a good kind of fat! DHA is a building block of the brain and eyes. Pregnant women and breastfeeding moms can eat fish to give DHA to their babies. Eating fish can lower the risk of heart disease. The benefits of eating fish outweigh the risks when eating fish low in mercury and other contaminants. Young children (under age 15) and fetuses are more sensitive to mercury. Too much mercury can cause lasting problems with understanding and learning. But studies show children benefit developmentally when moms eat fish low in mercury during pregnancy. Follow the guidance linked below to prevent mercury and other contaminants from building up in your body. Contaminants take time to leave the body, so spread out your fish meals. For general guidelines to help you make decisions for yourself and your family about your fish-eating habits, visit: www.fda.gov/food/foodborneillnesscontaminants/metals/ucm115644.htm. For recipes and information about eating fish, go to www.chooseyourfish.org. Consumption guidelines for lakes and rivers where fish have been tested for contaminants. Guidelines are also searchable by lake at: www.dnr.state.mn.us/lakefind. Reprinted from the Minnesota State Department of Health.